All-Candidates’ Forum, a collaboration between Nanton, High River and Claresholm Chambers of Commerce. This will be the only forum held north of Fort Macleod for this election. All five Livingstone-Macleod candidates have indicated they will be participating. Please share this far and wide. All are welcome to attend. The Board for the High River Performing Arts Foundation invite you to attend their upcoming event. Topic: They will reveal the architect’s renderings of the venue. and share their fundraising plan and business plan. President of the High River Performing Arts Foundation. Topic: The new performing arts building on fifth avenue. 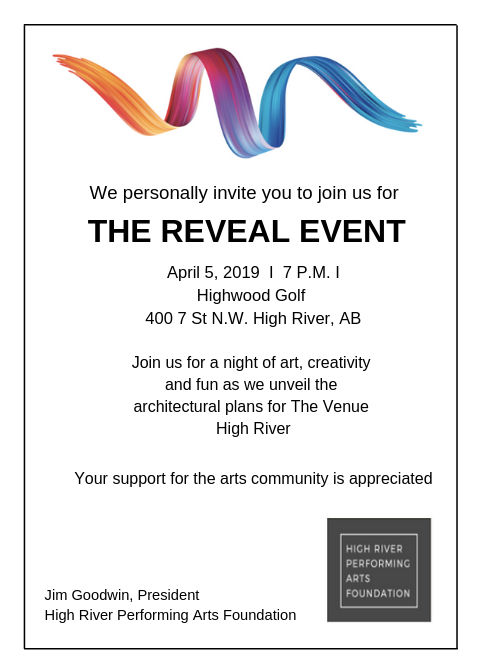 Topic: The board for the High River Performing Arts Foundation will reveal the architect’s renderings and share their fundraising plan and business plan for the venue.